Bisi Bengaluru: Grin & Bier it! With breweries sprouting in every nook and cranny, serving up ales, lagers, and craft in robust mugs to glug away, 'Pub City' is on track to become the guzzle capital of India. The latest to hit the circuit is a pleasant and very grungily interiored surprise. Nestled in the bylanes of bustling Koramangala, is this refreshing haven. Its entrance has a white stucco finish of an Italian chalet... and large wooden doors that almost immediately make you want to walk in. We already liked the name, The Bier Library, wish there were books on beer though. Would be nice to have some beer banter. The owner Prashant Kunal explained that the “library” is inspired by the idea of having beer collaborations with other brewers in the city. It opened its doors in November, and has six specially crafted beers on its tap. An interesting concept curated by a bunch of friends, Prashant Kunal, Geetanand Rajagopal and Abhishek Chadha, other brew masters can come in on a revenue-sharing basis, to experiment and give customers different beers, and recipes in specially curated events. Helming their own beer is Amit Mishra and Ishan Grover. Chef Manjit Singh comes in as consultant chef to curate a menu with a regional touch, and surprisingly, much to our delight, no Pan Asian. “It was a decision we made as beers don’t go well with Pan Asian... Our regional favourites like the Andhra Chilli Chicken and the Rara Ghosht is good. The Delhi chicken butter masala is good too. We are currently experimenting on a donne biryani, and will keep innovating with the food with Manjit,” explains Prashant. The idea of collaborating on beers with other breweries sounds like a beer paradise for sure... We wonder if other breweries will be open to sharing their trademark recipes? Not so sure. Though Prashant feels that it would create a library with different malts and brews, “Like we could get a brew master from Pune or from other parts of the city. They don’t have to share all the recipes, but they can surely share one from the many, right? 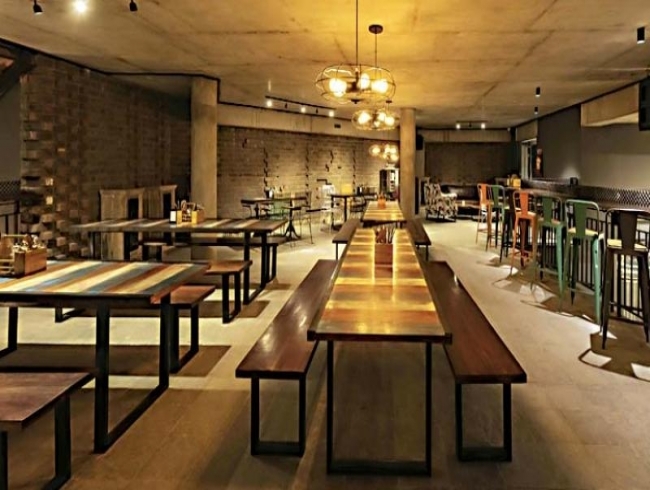 The idea was to make it a library of beer, a brand new concept in the city,” explains Prashant. In fact, the next collaboration planned will be with the Yellow Submarine brew master. An expansive, if quaint central courtyard overlooks different areas of this brewery that boasts a fish pond at its centre, chairs, bar stools and granite tables offering one different areas to glug away. One can’t believe it is right in the heart of Koramangala’s 80 Feet Road. The one thing that stood out was that unlike many microbreweries that await their license with sweat on the brow, and consternation, this one comes ready to serve you pints! We must admit that it has taken a lesson or two (in interiors) from an expansive brewery that is all the rage on Hennur Road, though. We started with a lager that was light, refreshing and subtly citrusy... and a Kerala beef fry (they have chicken ghee roast and a beet cutlet that sound delicious). The masala and spice was good, though the beef was tough, and not fried, more sautéed. We would have loved the original crispy bite. Their garden and fruit salad of arugula with fruits, feta and walnuts came heaped in a wooden bowl, brimming with fruit and a nice sugar-glazed walnut sprinkling, which was yum. The arugula was limp sadly, and there was too much fruit. It was tasty... though we like our salad leaves fresh and crunchy. The next on our list was the 21 inch wood fire oven pizzas that are quite the rage. You can order a slice of your favourites, in a larger than life size. We ordered a Beef Ragu, minced beef with cheese overflowing, it came packed with delicious gooey mozzarella cheese, yummy mince. Our favourite was definitely the Spanish chorizo and egg. The welcome tenets of Spanish chorizo, with an egg cracked over it. The crust could be thinner... The pizzas are original and packed with all kinds of toppings, a must-have. There are a slew to choose from – pepperoni, a gluten-free linguria, or a nero black pizza with activated charcoal with a creamy burrata or a bacon and prawn one... There are burgers, sandwiches, salads and pastas too. And many small plates that are interesting, keeping with the trend, and some hearty curry bowls for desi khanna after one too many ales! We also ordered a mushroom, onion ricotta quiche that came with a welcome crisp leafy salad… good, caramelised onions and a cheesy texture - perfect with the salad. Our favourite though, apart from pizzas was a dessert that we were most surprised to see on a Bengaluru menu… a Goan favourite that was at one time served at Club Vasco in Panjim, and we’ve never had one that was as good. Kudos… as this one was quite good… layered with cream and biscuit crumble… and tiny flowers (lovely presentation). It’s simple, nothing gourmet but delicious! A must-have. Called Serradura, it’s an ode to any child’s milkmaid fetish. The 20,000 sq feet two floored Bier Library with exposed bricks, Mangalore tiles and natural stone is pet friendly. It’s nice for Koramangala to get a space that has been tastefully done to catch up with friends and have a night out. The service is good, some dishes could do with some more flourish. “The lager and wheat beer is popular, though my favourite is the IPA,” says Prashant. A glug is always nicer in a quaint courtyard amidst greenery, as your mind wanders on what to order – a pizza for sure with a tap of lager please!